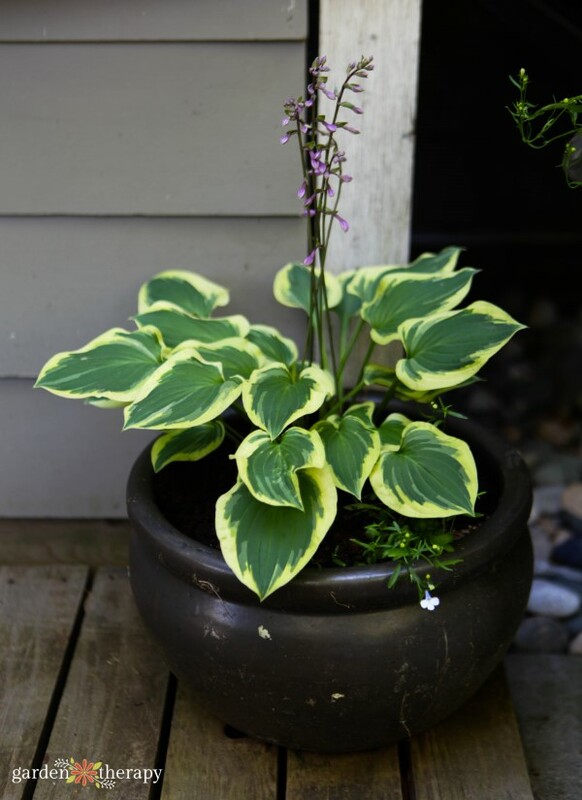 If you are looking for an easy care plant that brightens up the shade with gorgeous foliage and fragrant blooms then Hostas are the plants for you. These shade-tolerant perennials have stunningly ornamental foliage in practically every color of green you can imagine, they come in a range of sizes from minuscule to gargantuan, they are hardy in zones 3-9, and you’ll be happy how prolifically they grow because you can EAT them! If you are not already growing hostas in your garden, now is the time to start. 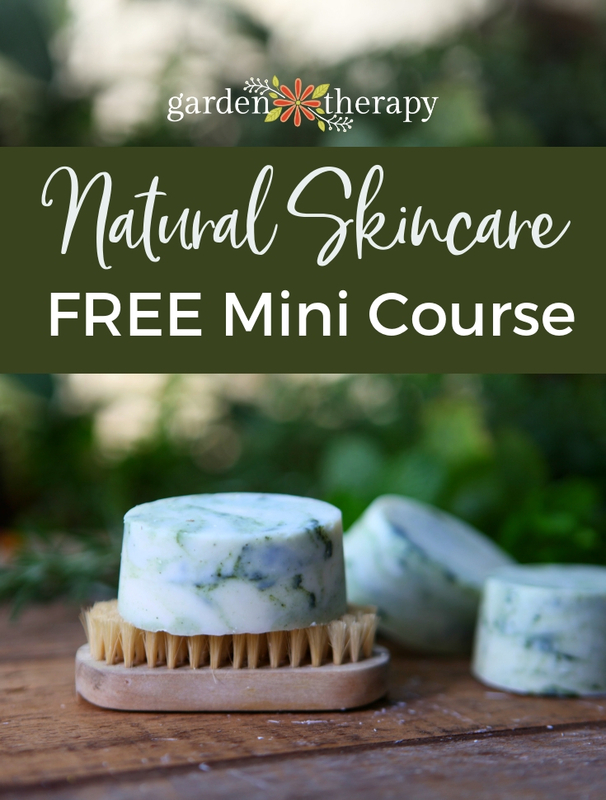 This guide covers all that you need to know to grow, care for, and divide these lovely leafy beauties. They grow from rhizomes which send out underground runners to produce new plants. 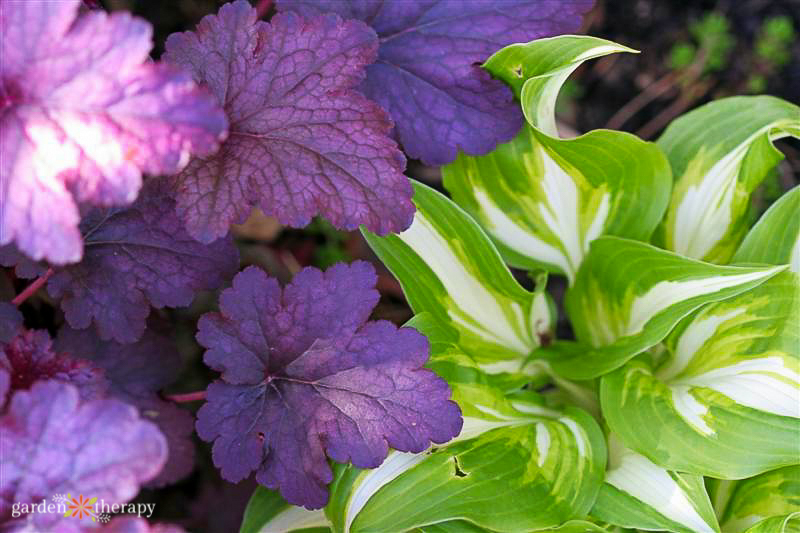 Hostas are shade-tolerant plants notable for their stunning ornamental foliage and come in many varieties of size, shape, texture, and color. 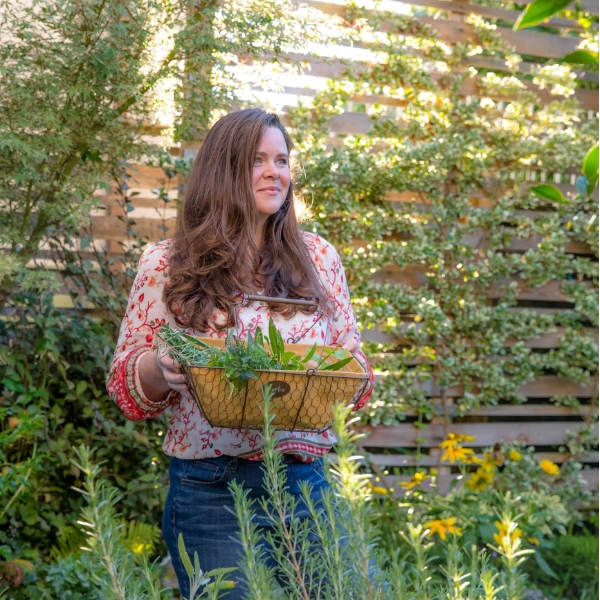 They are perennial, very hardy, edible, and decorative—a gardener’s dream! 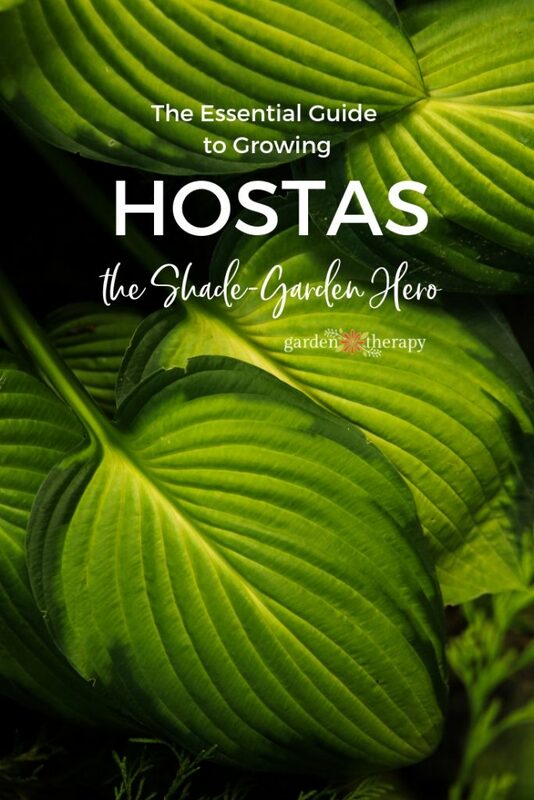 Because hostas are so low maintenance—they thrive in the shade and need very little attention—they are a wonderful plant for those who can’t exert themselves too much physically in the garden as well as first-time or “black-thumb” gardeners. 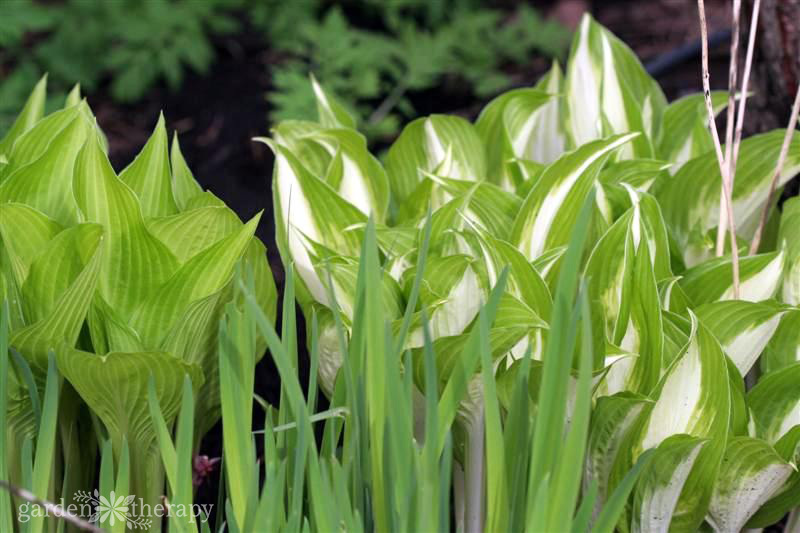 Hostas are most loved for their attractive foliage. Leaves can be lance-shaped, oval, circular, or heart-shaped, and come in green, white, yellow, gold, silver, blue, and many different colorful variegation. Choose hostas for your garden based on what your design needs are. Deep blue foliage on large leaves will ground the design and provide a backdrop to flowers and decorative foliage plants. Hostas with variegation, ruffled edges, and a light-coloured leaves will add focal points that lighten up the shade garden and add interest. Hostas are mostly known for their striking foliage, but the flowers are worth mentioning too! 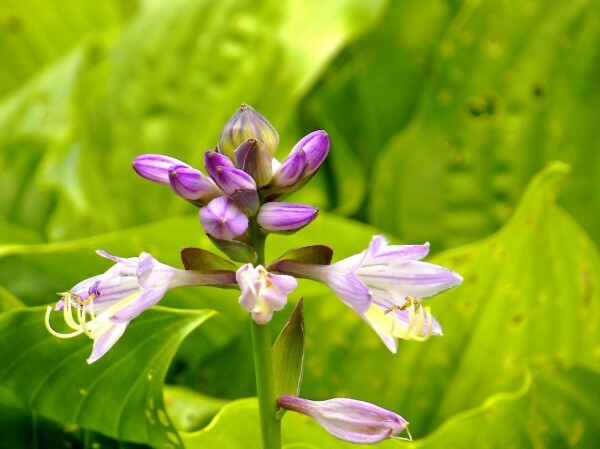 Hosta flowers grow on scapes (long, leafless stems) protruding from the center of the plant. They flowers bloom in white, lavender, or purple, and some varieties have wonderfully fragrant blooms. The flowers are popular with pollinators so don’t be so quick to cut them back, although doing so will not hurt the plant. While each variety will have different sun tolerance, in general the varieties with light green, lime-green, and white leaves need shade to thrive. 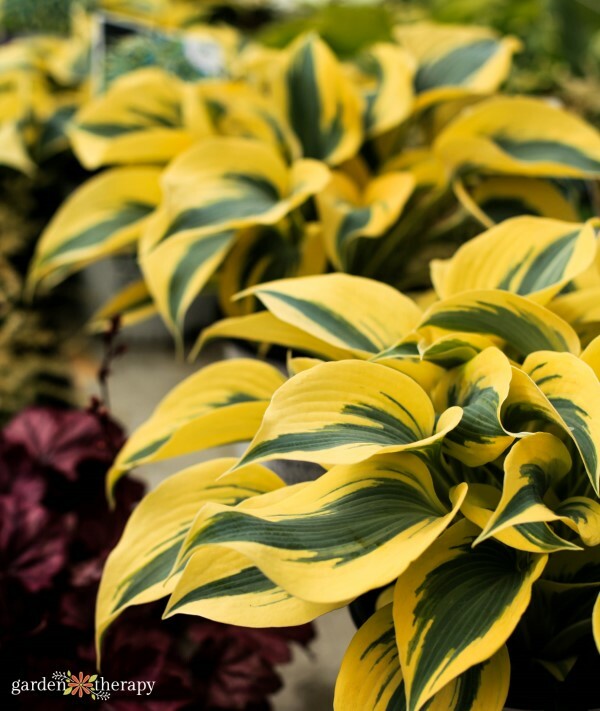 Hostas with a bit of gold or yellow on the leaves can sometimes tolerate more sun. But don’t trust the leaf colour to tell you if the plant will do best in sun or shade, it’s better to know the variety. Head over here for a great list of sun-tolerant hostas. Plant hostas in humus-rich, somewhat acidic soil that has good drainage. 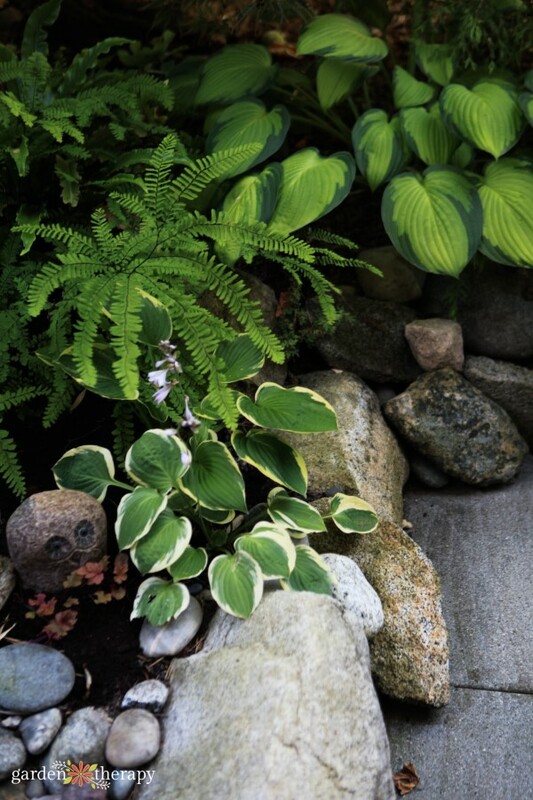 Leave plenty of room where you plant them because hostas will spread and fill out the space around them. Fall and spring are the best times to transplant hostas. They can be successfully transplanted in the summer as well, but they usually do better when the temperatures are cooler. Hostas divide quite easily, read more about how to divide perennials to see the steps to do it. 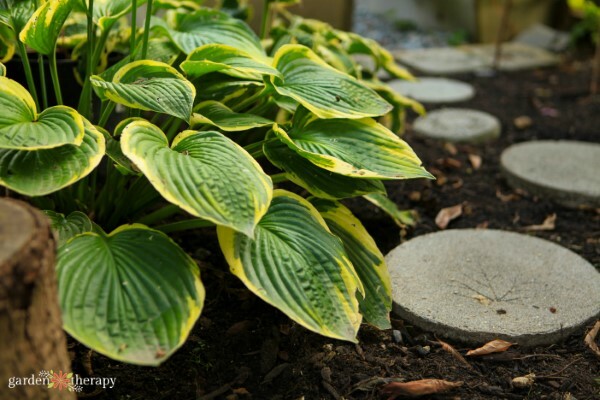 It is best to divide hostas in spring or fall as this is when they retain the most moisture. Either divide them on a day when the soil is already moist from rainfall, or water them well the day before you plan to divide them. Position your spade in the soil nearby the clump of hostas you want to divide, keeping it far enough away that you don’t damage the roots very much. Dig down underneath the rhizome (the depth will vary greatly depending on the variety of hosta) and gently scoop up a clump of hostas. Gently shake or brush with your hand to remove soil and then either pull or cut apart the clump. You can separate each individual stem to make a lot of divisions, or you can cut the entire clump in half or quarters for larger divisions. Plant divisions at the same depth that they were growing in before, add compost or humus-rich soil, and soak generously with water. The biggest challenge you will have in your garden with hostas is all the wildlife that wants to enjoy them too. They are irresistible to deer, rabbits, slugs, and snails who can’t get enough of those sweet, sweet leaves. If you share your garden with deer and rabbits, then there are a ton of home recipes and folklore you can try to protect them, but the most effective deterrent is to fence them out. Slugs and snail damage is generally minimal if the plants are healthy and you keep the gastropod populations from getting out of hand. I set a block of wood in the garden near the hostas for slugs and snails to hide under when the sun comes out. I simply lift the wood and remove the slugs daily until I’m not finding them. Hostas like to be moist so water regularly, especially during the driest part of the year. 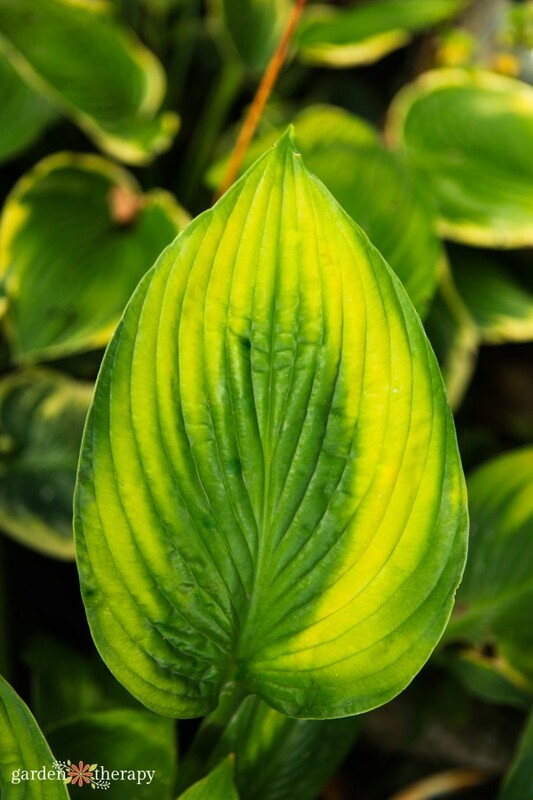 However, if the foliage starts to yellow, this can be a sign of overwatering, so pay attention to what your hosta is telling you and water accordingly. Hostas are generally easy going plants with great disease resistance nor do they attract a lot of pests beyond the aforementioned critters who know how tasty they are. Because there are so many varieties, there is a hosta that works well in almost any type of garden! They are great in the ground or containers; as groundcovers or edges, as foundation plants or focal points. The hostas clumps get larger each year and great way to keep these prolific plants in their allotted space is to eat them! That’s right, hostas are edible. The new spring shoots are harvested from the outside of the plant which keeps them looking lovely in the landscape. Harvest the “hostons” (the curled-up leaf shoots that poke up in the spring) by snapping them off at the base of the plant. Prepare them sauteed with a drizzle of sesame oil and soy sauce or roast them like The Backyard Forager does. Each hosta variety has a different flavor ranging from “similar to spinach” to “asparagus-y” to a “slightly bitter peapod taste.” You can also eat the leaves, which are best boiled with a bit of salt, and the flowers, which are good raw added to salads or as a decorative topper for cake or other desserts.